The 14th century artist Giotto di Bondone, considered by critics to be one of the founders of the Italian Renaissance. The Basilica di Santa Croce is the main Franciscan church in Florence. 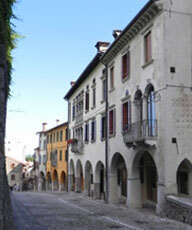 It is situated on the Piazza di Santa Croce. 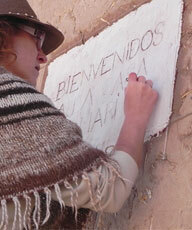 The site, when first chosen, was in marshland outside the city walls. Legend says that Santa Croce was founded by St Francis himself. It is the burial place of some of the most illustrious Italians, such as Michelangelo, Galileo, Machiavelli, Foscolo, Gentile and Rossini. Its most notable features are its sixteen chapels, many of them decorated with frescoes by Giotto and his pupils, and its tombs and cenotaphs. The Peruzzi Chapel pairs three frescoes from the life of St. John the Baptist (The Annunciation of John’s Birth to his father Zacharias; The Birth and Naming of John; The Feast of Herod) on the left wall with 3 scenes from the life of St. John the Evangelist (The Visions of John on Ephesus; The Raising of Drusiana; The Ascension of John) on the right wall. The choice of scenes has been related to both the patrons and the Franciscans. Because of the serious condition of the frescoes, it is difficult to discuss Giotto’s style in the chapel, although the frescoes show signs of his typical interest in controlled naturalism and psychological penetration. 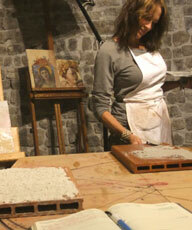 The Peruzzi Chapel was especially renowned during Renaissance times. 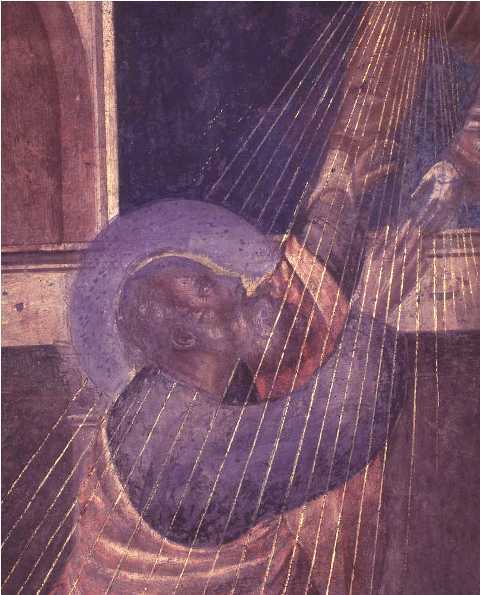 Giotto’s compositions influenced Masaccio‘s Cappella Brancacci, and Michelangelo is known to have studied the frescoes. Giotto’s paintings in the lance-shaped chapel are believed to have had a major influence on Michelangelo painting, who was born nearly 140 years after Giotto died and who painted the Sistine Chapel in the early 1500s. Thanks to the collaboration between the Opera of Santa Croce, the Gallerie dell’Accademia and the Getty Foundation in Los Angeles comes, during the restoration, the extraordinary discovery about the Giotto’s frescoes of the Peruzzi Chapel in the church of Santa Croce in Florence. 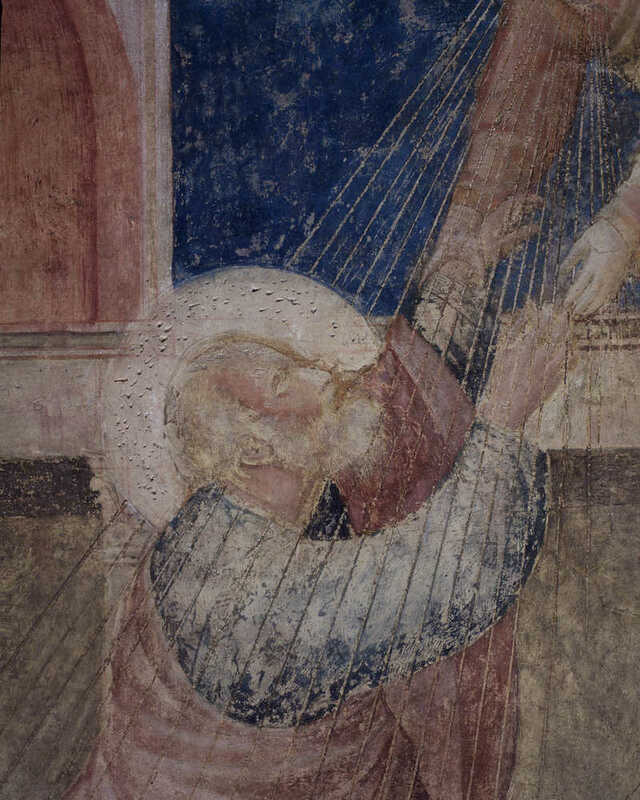 Restorers and researchers began an ambitious project of ‘non-invasive diagnostics’ to ascertain the condition of the 12-metre-high chapel, which Giotto painted in about 1320. The diagnostic campaign of the fresco in the Peruzzi Chapel has obtained surprising, as fundamental and remarkable results that will change the course of studies on Giotto. Using the investigations with ultra-violet rays (UV) the restorers have rediscovered rich original details such as the light and shade which create the massive volumes and figures that give a realistic presence and almost three-dimensional space. 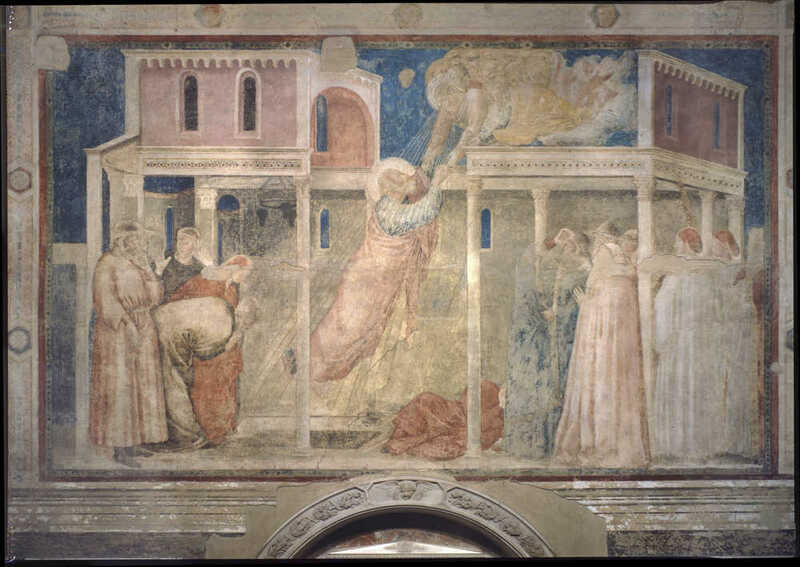 Giotto di Bondone painted the Peruzzi Chapel towards the end of his life and some experts believe he was striving for a different effect than he achieved with the fresco technique, in which the painting is done while the plaster is still wet. ‘It allowed him to obtain something more rich in terms of colours, of decorations, but over time, dry painting is very fragile,’ Ms. Cecilia Frossini said (Direttore Settore di Restauro delle Pitture Murali, Opificio Pietre Dure). ‘I hope we can find enough funds (estimated approximately 200,000) euros to have a complete ultra-violet mapping of the whole chapel in order to build some kind of virtual software to share all that we have discovered with the general public,’ Ms. Frossini said.